From left to right: Ingrid Williams of AeroFarms, Megan Myungwon Lee of Panasonic Corporation, Jonathon Cortell of L+M Development, and Arcelio Aponte of Rutgers’ University Newark. Creating a high-tech hub isn’t a matter of site selection and zoning, like one would site, say, a supermarket. That’s why developers and policymakers who are working to make New Jersey a leading technology center talk about creating an “innovation ecosystem.” It’s something that is able to grow and thrive on its own, provided it has the right environment. Four enterprises are cultivating that environment in Newark right now: Panasonic Corporation, AeroFarms, L+M Development and Rutgers University Newark. 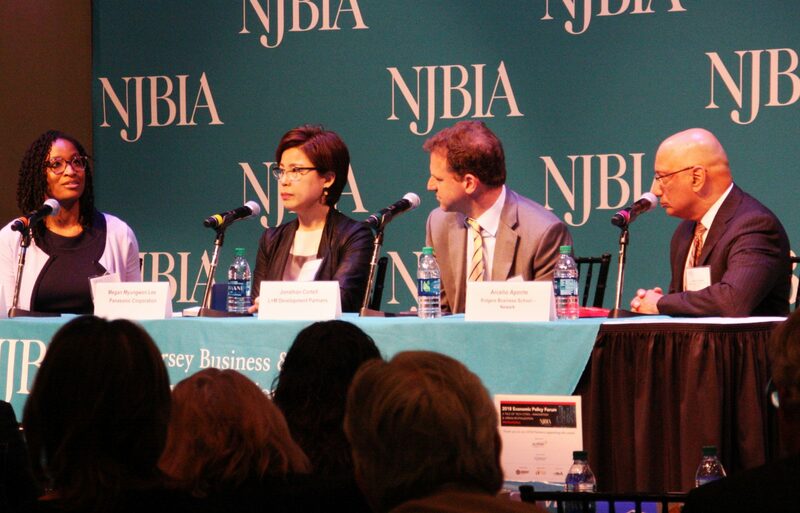 On April 30, they participated in a panel discussion led by NJ Tech Council President and CEO James Barrood at the NJBIA-Audible Tale of Tech Cities event. In some ways, it’s as simple as providing widespread internet access. It is easy to overlook, but internet access is fundamental when it comes to creating a space for high-tech workers. Rutgers’ Arcelio Aponte, senior vice chancellor of Economic Development & chief financial officer for Rutgers University-Newark, echoed the idea, noting about 50 percent of those in poverty don’t have access to the internet because of affordability issues. Abundant internet access gives New Jersey more opportunities to promote tech talent from its native population. It’s important to remember, however, that talent isn’t reserved for those with advanced college degrees. Apontepointed out about 20,000 jobs are available in New Jersey that involve some type of computer coding. “It doesn’t mean that the person who fills that job has to be a graduate from a STEM field,” he said. In fact, tech-based businesses provide opportunities for all levels of education. Ingrid Williams, head of human resources for AeroFarms, the world’s leading indoor vertical farming company located in Newark, noted that there is a mix of workers in their operation that offers opportunities for everyone along the skill-level spectrum. “I think that’s one of the great things we are able to provide to Newark is that we are able to employ all of its citizens and all of the people who live here that are looking for a way to provide for themselves and their families,” Williams said. That also means stemming the tide of New Jersey’s out-migrating millennial population. As NJBIA’s studies have shown, millennials are the largest segment of the population leaving New Jersey. Keeping them here is important for preserving the skilled workforce of the future. Megan Myungwon Lee, chief human resources officer and vice president of Corporate Planning and Strategic Initiatives for Panasonic Corporation in Newark, approaches the how-to-attract millennials problem in a simple way: Listen to them. The goal is to not just teach millennials about Panasonic, but make sure the work environment is comfortable for millennials. That is wonderful but what about a seventy year old who has more application systems, technical infrastructure, business operations knowledge and expertise able and willing to share who has been tagged as a worthless employment commodity. I think it’s time we recognize the wealth of knowledge we have forced out of the workplace and the state of NJ and now we are worried about making the work environment comfortable for millennials. I created automated production applications from people who understood how to build product and transfer that knowledge at sixty years of age willing to learning the new technology and continued to work. Is their a millennial out their who wants to run blow mold equipment or robotic press or has a clue what that even might be. We have destroyed a fundamental segment of prosperity in this state manufacturing, now trying to catch up using technology as the economic solution. It’s a long road to hoe. I guess after a very long unsuccessful effort of searching for a opportunity attempting to add value and contribute to the NJ workforce I have given up seeking employment . Not that it matters to anyone, I to like so many will be fleeing the state by year end. I can only wish you all the best in finding a solution to the crisis that prevails. I concur with what Robert Rocco says. If we get back to teaching basic mechanical trades in NJ – and using the tribal knowledge that is understood by our seniors – this will spur the thought and understanding process to help solve current and future problems. If we start immediately, New Jersey can score BIG.